Sierra Leone « Why did you click here? We were used to kids following us around, so enthralled by the actions of the “white guy,” (a word synonymous with foreigner, even with my somewhat browned complexion all I ever heard in Burkina was ‘le blanc’ [aka in local language = Tubabu]). I had joked often during my service that the greatest show for kids in Africa would’ve been of the reality variety, displaying in 30 minutes segments, white guys sitting outside their house reading. No matter how often I did that in my village over the course of two years, kids were always captivated enough to come watch for endless periods of time. So actually walking around and looking at things was all the more fascinating and tended to attract the youngins. However this girl was older than that average age, she looked about 15-16 instead of 6-8. Also most of the kids followed for a while, but eventually grew bored when they realized our lives were no less mundane than their own. This girl had been with us since the East End Market until now – we had crossed the entire city of Freetown basically in the past few hours, this wasn’t just ambling around some little village. She must’ve been quite interested, but the most odd thing of all was that she made no attempt whatsoever at interaction. In fact she had no reactions to speak of at all, she was barely even looking at us most of the time, just walking alongside. Usually kids were running around saying “hey white people, give me a present,” or “tubabu, the Russians beat you to the moon,” and giggling away in the background. That, or slowing down then speeding up when we weren’t looking. It was always clear they were enthralled by us, and part of their rush was getting us to recognize the fact and maybe even interact with them. This girl didn’t play that game, her facial expression remained the stoic emotionless stone glare it had been the entire time. She had been around long enough at this point, I figured we might as hold an official ceremony and sacrifice an anti-semitic giraffe to officially initiate her as our 6th group member (aka Black Shark). That was one possible reaction, but due to a global shortage of anti-semitic giraffes in 2007 (there were tons of semitic ones however), it did not pass group majority vote. We kept on walking, unsure of what to really do, and she kept on following, ostensibly unsure of what she wanted. Eventually Diego, perhaps as fed up by her stalking as by own our inertia on the bold action taking front, turned to her, asked what she wanted, and told her to leave us alone. She paused, but didn’t say anything, or even react much at all. It was probably that she only spoke a local language and not much English. She slowed down for a bit as I’m sure Diego’s gestures were telling enough, but continued stalking and soon enough was right back where she started, smack dab in the middle of our group. By now we kind of just figured, like all the little kids, she’ll eventually get bored and go off on her own – though nothing in the recent history of this situation would indicate such an outcome. We were hoping I guess, because there wasn’t much else to do besides occasionally telling her to go away. We had been walking for a while and were starting to get hungry. If we sat down at a restaurant she wouldn’t follow us in we figured. She might wait outside for us, but the line of thinking went that she’d get bored or fed up that we weren’t treating her as well, and leave on her own accord (perfect way to avoid actually doing something). We were in the downtown harbor area of Freetown, near good ol’ Mama Joyce’s House of Curry. Might as well stop in and say hi to our old friend. As we entered the restaurant Black Shark followed us up the stairs. Diego again turned around and said “No, no.” She stopped, we continued, and sat down without. She had kind of left, maybe she was waiting for us outside, but at least she had listened and not come into the restaurant. We considered the matter to be essentially done and starting discussing the peculiarities of it amongst ourselves. Mama Joyce came in and greeted us. We ordered some food, sat back, relaxed, and enjoyed the harbor view from the second floor of Mama Joyce’s prime waterfront location. Less than 10 minutes later Mama Joyce came in and asked if we wanted anything for our friend. Confused, we asked her what she was talking about. She wanted to know if we were going to order any food for the young girl waiting for us in the other room. She was still there! She hadn’t even left the restaurant but was waiting for us next door! This was beginning to reach a creepy, stalker level; something had to be done right now. As is typical in difficult situations in West Africa, it was fairly easy to outsource our response, using a third party as they would say, to avoid direct confrontation. We explained the whole situation to Mama Joyce, who had a look of astonishment in her eyes. “I thought you fine young gentlemen wouldn’t be parading down the street with a 14 year old girl dressed like this,” implying that her following us in the manner she was dressed gave the appearance that we were up to various uncouth activities with the young local Leonean women. That thought hadn’t even crossed our minds (though I can’t really speak for everyone), but I guess that is what it could’ve looked like from the outside. Mama Joyce, with the distinct style of an older mother subscribing to the tough love approach, told us she’d deal with the little one, to our relieved expressions. I relaxed a bit, sensing the beginning of the end of Black Shark’s short tenure with us. But it was about to get weirder before it got any normaler. We heard a lot yelling emanating from the room next door, along with what sounded like occasional slap. We collectively started to wonder if Mama Joyce’s house of tough love was perhaps a wee bit too tough. Better than to get involved though when it looked like a punishment was too harsh, a lesson we had learned quickly during our time in village. If a kid gets in trouble, he suffers for it around here. They are well whipped into shape, using a variety of methods ranging from large sticks to direct head slaps to old fashioned spankings. While the methods may seem harsh from a Western perspective, Africans have their own ways of punishing children (as most cultures in the world do I would imagine), and who be it for me to stick my nose in their business (even though as a ‘business’ volunteer that was technically my job). It is a bit hypocritical telling a mother on her 7th child that’s she doing it all wrong, given all my experience in child rearing (I have grown sea monkeys before though and they did need to be whipped in line on occasion). By the end of my service very few punishments seemed overly harsh to me, in fact I had fallen more into the camp of ‘kids get what they deserve.’ Punish them hard now and later on you can punish them hard again, so the saying goes I believe. Hell, I even chased after kids with sticks to attempt beating them every now and again when they pissed me off, and I didn’t own 11 of them (I’m glad they could outrun me, my minatory poses were purely bluffs in nature). At any rate, we had all gotten used to the usually severe penalties on misbehavior around these parts. However this was one of the first times in two year that I felt a twinge of compassion (literally). This young girl really didn’t do anything outright naughty. It was more a bit odd that she had followed us for so long. But she never said anything, never once bothered us. To get beat for that, and knowing that we led her directly into that beating, was a bit uncomforting on the conscious. I felt for you Black Shark, I truly did. 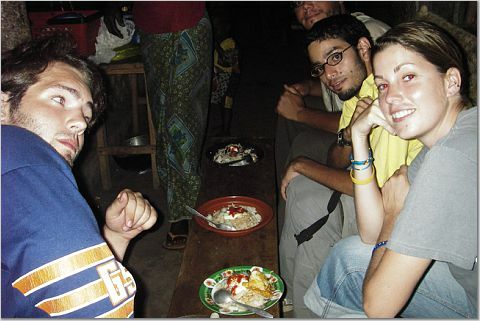 After a 2 year stint in a Burkina Faso village with the Peace Corps, I traveled around with four good fellow volunteer friends. We adopted the moniker ‘Shark Force 5’ and ran roughshod over 8 West African countries in a 10 week span. Enough entertaining stories occurred to fill up a book (and indeed that is the goal), but today I am focusing on our return to Freetown, Sierra Leone after spending some time at a pristine but shady Lebanese beach house (a story for another time), and the surprising emergence of Black Shark (it’s not racist because it’s a proper noun!). 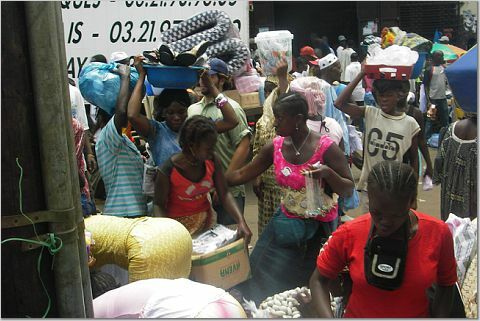 During the crowded Where’s Waldo type scenes that make up the East End Market in Freetown, one girl surprisingly stood out amongst the mob. She seemed young, but what was most striking was her attire. Unlike the average female Sierra Leonean in this daily market who tended to be wearing local clothing or old t-shirts covering the majority of their tops (unless of course they were breast-feeding, then it was all hanging out), she was wearing a small pink tank top with only a thin, string line tying together the two sides across her back. Basically her entire back was being flaunted about. I say this not in any sort of perverted manner (mostly) but because it made her distinctly noticeable, in this mass crowd of people. This was a first, in Burkina you would get many tank top wearing girls, often with much cleavage or more protruding, but to see an entire bare back down to the waist, well that was something I simply hadn’t come across (unless of course it was just your typical shirtless 42 year old mother of 19 doing laundry by the river, a picturesque scene if there ever was one). Regardless of the distinct first impression this young girl made, our frame of mind was more focused on finishing this Waldo page before running into Odlaw (if you get that reference you are my hero). She was nothing more than an afterthought once we exited the somewhat organized mayhem that was the East End Market maze for hopefully the last time. We continued on a random walking tour of Freetown, ambling our way across the entire city, stopping off to check out various interesting things here or there. The brunt of our day consisted of such activities. It was maybe an hour or so after departing the market when I noticed another bare back. Maybe Sierra Leoneans had a totally different sense of dress (we had come across more shirtless women in the villages here than any place before – someone had a detailed tracker going . . . ). Considering this country, though still dominant, wasn’t nearly as strongly Muslim as our previous jaunts (Guinea, Mali), that was distinctly possible. But this tank top was also pink and in the same style. Maybe that was just the ‘in’ attire all these crazy post-war Leonean kids were rocking these days. Yet it soon became clear that this was the same young lady. How curious I remarked silently. To myself. What were the odds of running into a person who had been in the market with us, when we were all the way on the other side of town now? Thinking no more than that, we continued on our self-designed tour. She however, seemed to be on the exact same tour. Even more curious since she didn’t look like much of a tourist, and our route was indeed quite impromptu; it was highly unlikely that her rash touring decisions coincided with ours at every turn. I was thinking that something was strange here, not least of which was my obsession with Where’s Waldo. No one had mentioned anything, but I believe we were all starting to sense the same thing around the same time; it was a gradual but inevitable realization. Our paths were coinciding way too much for this to be purely coincidental – this girl was unmistakably following us.